MANILA -- President Rodrigo Duterte remains to be the national official with the highest approval and trust ratings, in a recent Pulse Asia survey, Malacañang said Tuesday. Results of the survey, conducted from Sept. 1 to 7, showed the President scored a 75 percent approval rating and a 72 percent trust rating. These figures are 13 points and 15 points lower than his approval and trust rating in the previous quarter at 88 percent and 87 percent, respectively. “I believe that’s still a very good approval rating. Certainly still the highest of all the officials surveyed by Pulse Asia,” Presidential Spokesperson Harry Roque said in a Palace briefing. In the same survey, Vice President Leni Robredo scored a 61 percent approval rating and 56 percent trust rating; Senate President Vicente Sotto III scored a 73 percent approval rating and 66 percent trust rating; and Acting Supreme Court Chief Justice Antonio Carpio scored a 42 percent approval rating and 33 percent trust rating. House of Representatives Speaker Gloria Macapagal-Arroyo scored a 19 percent trust rating. The survey did not show she received an approval rating. Roque said Malacañang is “not affected” by lower survey ratings, noting that the President is more focused on doing his job. “The President rules because it is his constitutional duty. He doesn’t rule for survey results. Maraming beses na po niya sinabi ‘yan (He has said that several times),” he said. 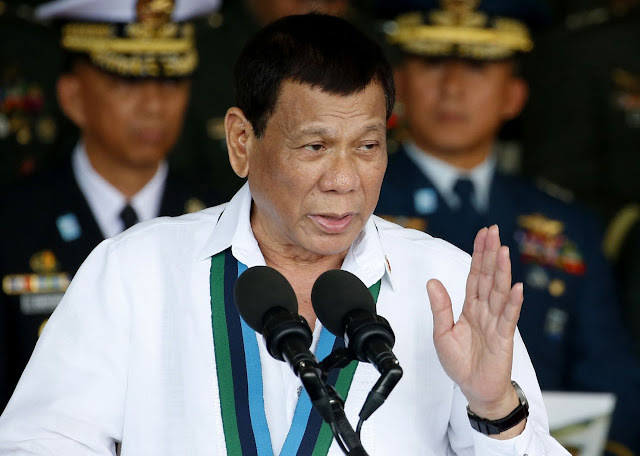 “We take note of the survey results but we are not affected by it because ang Presidente naman (the President) will do his best to discharge his duties as President and Commander-in-Chief,” he added. Roque, meanwhile, said resigned National Food Authority (NFA) Administrator Jason Aquino and how he managed the country’s rice woes affected the President’s approval and trust rating. “Why do I say these things about Jason? Parang 'yung single issue ng bigas, nakalimutan na ng tao 'yung ibang achievements sa administrasyon dahil malapit nga ito sa sikmura (Because of the single issue of rice, people have forgotten the other achievements of the administration because this is an issue close to the stomach),” he said. Roque, who said he was personally angered by this development, said Aquino could have prevented problems involving the country’s rice supply if the agency had assured that there was enough buffer stock. “So hindi natin maiiwasan yung pagtaas ng presyo ng krudo pero itong nangyari sa bigas dapat naiwasan ‘to kung sapat ang ating stock (We can’t prevent the rise in oil prices but what happened to the country’s rice supply could have been avoided had they assured we had enough stock),” he said. Roque, however, assured that the government is exerting efforts to reduce the prices of rice and other food products amid rising inflation rates. “Mapapababa po natin ang presyo ng mga bilihin. Hindi po natin mapapababa ang presyo ng langis, pero gagawa po tayo ng paraan para maibsan itong mahal na bilihin (We will be able to reduce the prices of items. We can’t lower the price of oil, but we will find ways to cushion the effects of the rising prices of goods),” Roque said. On Sept. 11, Duterte bared that Aquino wanted to be relieved from his post since he could no longer cope with the demands within the food agency. He is currently looking for Aquino’s replacement. Roque said he will look into the possibility of filing technical malversation and graft cases against Aquino for contributing to the problem of inflation and high prices of rice. “Kung walang magpa-file, ako mismo ang magpa-file. At hindi lang for technical malversation, papaylan ko rin siya ng graft (If nobody else will file a case, I myself will do it. And it won’t be for technical malversation, I’ll also file graft), Roque said.